Pumpkins and Batwings and Jewels…oh my! The Miranda gown is Wicca’s Wardrobe new fall release that was unveiled for the BOSL International Fashion Week in mid-October. It comes with the hat and opera gloves with Slink appliers. The Ruffles, luxurious fabric and beautiful details make this an elegant addition to any wardrobe. I’ve styled it with one of my most favorite jewellery sets from Chop Zuey’s Don Quixote collection called, “A Noble Heart” along with the Salutations to Jelleybeans bracelet also from Chop Zuey. Photographed at the beautiful, “Done Wiv a Twist” sim. I had so much fun styling this colorful outfit. 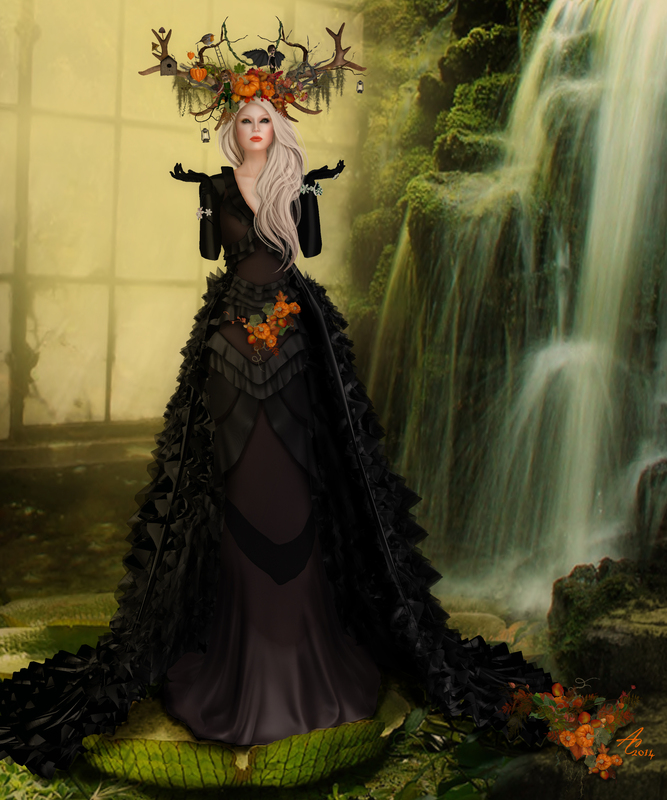 The headpiece is part of an outfit from Boudoir called, “Autumn Fairy”. The rich colors combined with the whimsical nature of the headpiece makes this look a feast for the eyes. I found the Linnda Coat from Purple Moon in my inventory and I believe it’s from last year’s fall collection. But I thought it matched the ruffles on the Miranda dress beautifully.